I have always been interested in RC for as long as I can remember. But this is not the time to tell that story. No, this is the thrilling story of what made me take the leap in to RC helis. It all began in the good old days, to be more specific the magic summer of 2003. I have always been an electronics geek and is those days the first generation Xbox were popular. I had already “chipped” 3 or 4 of these excellent consoles when I got the offer to trade a broken one for something “fun”. I managed to find something that he found interesting and I got myself a bargain. I fixed the Xbox in a jiffy and while I was at it I did a “TSOP Flash” (Makes the Xbox work like it’s chipped). I had it for a while but I didn’t use it much as my brother owned one and if we played we did so on his console, so I decided to put it up for sale. I got several e-mails from people that were interested but one stuck out more that the others. It was a guy that wanted to trade me a RC helicopter for my Xbox. Oh man, what a temptation! I could not resist. The heli I got in the trade was a Smartech Aerohawk Pro with the “scale” military canopy. 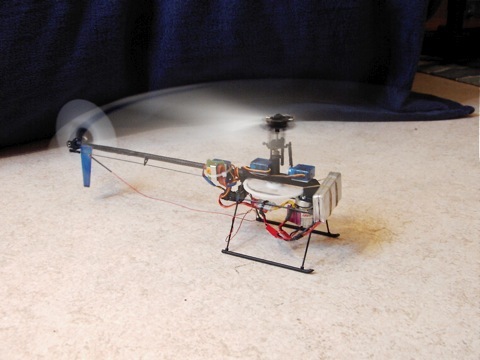 As anyone that have tried flying one of these small helicopters will know, it’s not easy. And here I was, a total newbie that had never tried flying anything remotely like one of these helicopters. Well as you can guess it did not end well. The poor heli had to take my abuse. I made my self a training gear and tried to fly it around my girlfriends yard (with fly I mean bounce around on the ground). Once I ended up in a tree and another time on the roof, but it was so much fun! Unfortunately the 3in1 unit gave up on me before I rely got the hang of flying. So I sold the heli. So I surfed around for a good deal on another small heli and found my self a Hornet. At the same time I bought a new fancy transmitter; a Hitec Eclipse 7. The best thing was that I now could fly on the SIM on the computer! There weren’t that many to chose from back in the day, but there were one free sim that had got some excellent reviews, and that was the FMS simulator. It was not pretty and not very advanced but it worked fine to learn hovering and orientation. I slowly got the hang of tail in hover after a lot of hours in the sim, but I had not tried flying the hornet yet. I had now read a lot of topics on the various forums and concluded that the Hornet was not the best heli to learn to fly with. I had now had the Hornet for about 2 months and had only powered it up 2 or 3 times, so I decided to sell it before I smashed it up. I actually made a bit of a profit on the deal. 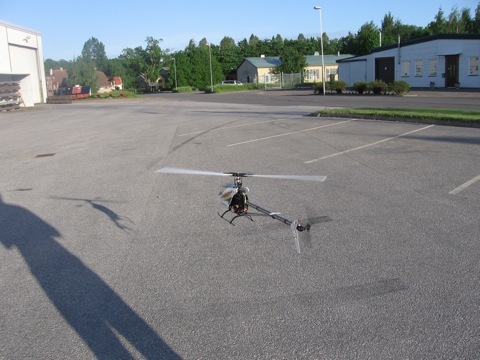 The forum that I hanged out most in was RCGroups and everyone was harping on about the Corona 120 as the best trainer heli, so I tried to find one here in Sweden. That turned out to be quite a challenge. There was only one vendor that was selling it and the price for a new kit was pretty step for me I tried to find one used. I could not find a single one in Sweden so in the end I ended up buying one from a guy in the US. It was a pretty sweet deal. 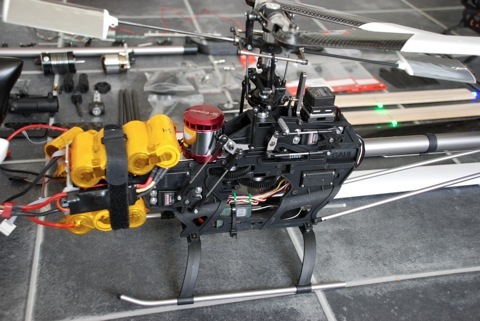 It was equipped with a brushless mega 16/15/4, Castle 25A Speed controller, Futaba GY240 and a belt drive conversion kit. By this time I could hover a heli tail in pretty darn good in the sim and it was time to start with the real thing. It was winter by the time I got the Corona, and those of you that have been to Sweden in the winter time knows that it can be quite cold. But I was not going to let that stop me from learning to fly! By this time my girlfriend had moved to an apartment in “down town Tibro” and it so happened to be that they had an inner yard that was nearly surrounded with buildings, which nearly always made it calm. And as a bonus the area was lit up, which was very nice as we only have a few hours of daylight in the winter. I charged the 6 cell Ni-MH batteries and heated a wheat bag to keep under my jacket and walked out in the -10°C snow covered night to learn to fly. I will never forget that feeling of for the first time be able to lift the heli of the ground and be able to set it down again. I was in love with this heli! It was so stable! The first flight I simply lifted about 1 cm of the ground and tried to hold it still and if it started to drift and I felt I was not in total control I putted it down again. Every minute or so I had to take a break to warm the fingers on the heated wheat bag. The batteries lasted about 10-12 minutes which was about as long as I could stay out without losing any limbs. After the flight I hurried in to charge the battery and warm up again so that I could go out again. Slowly my skill level started to go up and before the snow had gone I could hover it around both tail and sides in. By this time I started to fly around a bit. I tried to land on different things like a stone wall and the roof of a garage. What a wonderful feeling it is to learn to fly. By the summer I could do a bit of forward flight and now I decided to buy my self a Li-Po battery. I bought a 2s5500mAh which gave me about 35 minutes of flight time at the same weight as the old Ni-MH! This rely helped me evolve as a pilot as I now could have so much more stick-time. As the summer almost had turned into autumn I got a hold of small digital camera. Awesome! I thought. I can strap in on the heli and take some photos from the air! I mounted a servo to push the trigger and strapped the camera to the front of the landing gear at an 45° angel. That day had been extremely windy with a lot of strong gust, but I was so anxious to try it out. 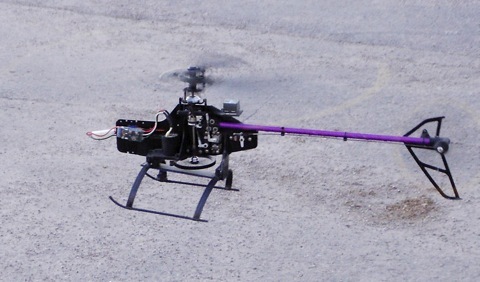 I hoped that the wind would subside in the evening so I could take it out for a test flight. When the evening came I looked out at the flag that we have in the middle of the inner yard where I lived. It was stock still. I rushed out as fast as I could and spooled her up. It lifted the extra weight with ease. I flew around a close to the ground and tried out taking some pictures. It worked just fine so I decided to climb up to some altitude to take a picture of the building that we lived in. It was apparently extremely gusty up there and as soon as the heli came above the shelter of the building it got hit by a massive gust that almost flipped the heli over! I tried desperately to get it back under control but before I could another gust took a hold of the heli and threw it upside down. I tried to save it but I could not. It smashed nose (and camera) first into an empty concrete parking lot. I ran as fast as I could towards it, and when it came into view I could see flames and smoke! I tore out the burning battery in my desperate panic to try and save the heli. Luckily I did not get hurt while doing this! Unfortunately the heli was beyond reasonably repair, and so was the camera. In fact it looked more like a crinkled aluminum can. After this I gave up on helicopters for a while. 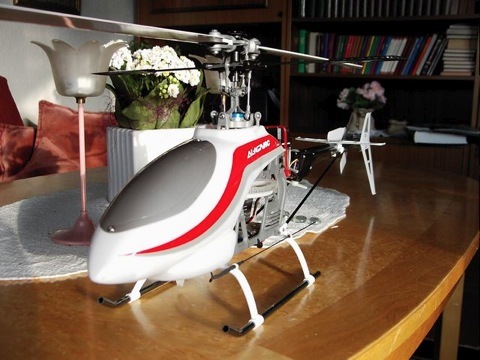 It would take until the spring of the next year before I ordered I new heli. This time I was going to try out the new T-Rex 450X from Align. 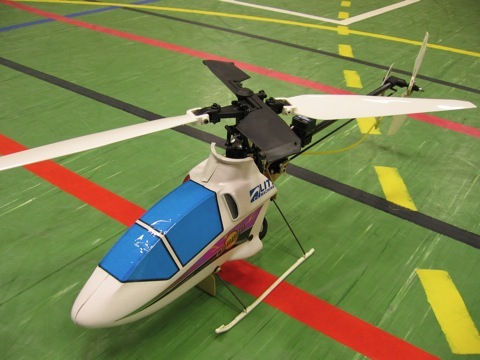 It looked like a promising heli and it had several dealers in Sweden were starting to stock it. I liked the fact that It was a “build it your self kit”. The building was fun and I used the mega 16/15/4 and the GY240 that had survived from the crash of the Corona. The first time I spooled it up I was quite terrified! It was so loud and the head speed was a lot higher than on my old fixed pitched Corona. I remember thinking; If this touches the ground it will self destruct instantly! But luckily I got it of the ground and did not crash it. It quite a different feeling flying this heli compared to the Corona. This felt like it was on speed! No more relaxed cruising around for 30 minutes, now it was explosive flying for 10 minutes. But after a while you got used to it. One of the servos locked up in the end and those of you that have tried flying a 120° CCPM heli with only 2 servos know its not that easy. I had modified quite a lot on it but I wasn’t rely happy with it. I didn’t want a self destruct heli that cost a fortune every time you made a slight mistake. So once again I sold a heli. The heli I wanted was something like a Corona 120. So I surfed around to try and find something suitable. I searched and searched but found nothing that would be perfect for me. But one day by pure change I found a 1 year old for sale ad with a Corona 120 here in Sweden, so I e-mailed him to ask if he by any chance still had it, and he did! It was perfect for me since I had all the parts from my old crashed Corona. There is something about this heli that makes me love it. Once again I bought my self some Li-Po batteries. But this time I bought 2(!) 2s3p 6600mAh ones! Actually I bought a 3s4p 8800mAh battery that I made two 2s3p 6600mAh ones out of. I flew this heli for more than a year before I crashed it for the last time. 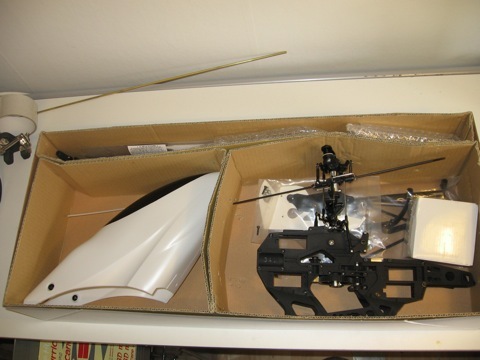 I did not have the spare part I needed and I thought that I would buy a bigger collective pitch heli. 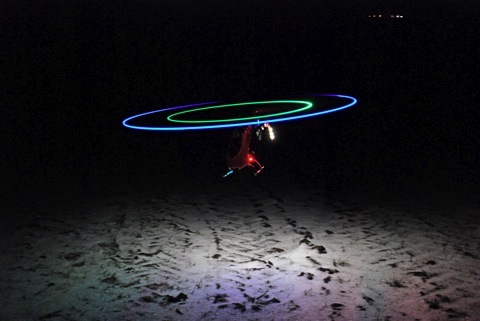 I regret it… It’s such a fun and simple heli! 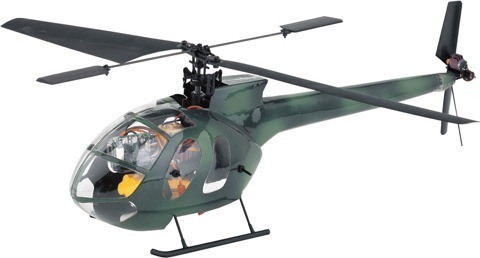 Gaui was releasing a new 550 class helicopter that looked very promising so I started to save up money for it. It took me quite a few months but in the end I got it! I like building stuff for my self so I took the heli apart as soon as I got it and put it back the way I wanted it. 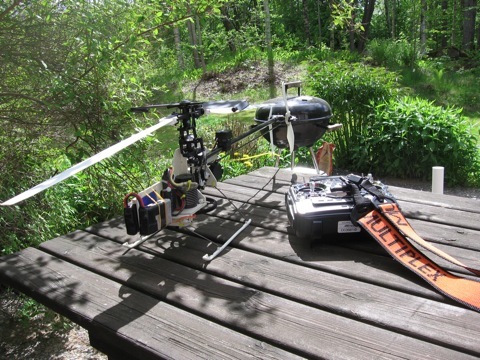 In the beginning I used the stock motor and ESC and a pair of 3s3200mAh batteries. This heli flew great! It was quiet and had a feel that appealed strongly to me. Now it was time to learn 3D flying! I practiced a lot of hours in the sim and finally gathered the courage to try it out for real. Here is my first attempts caught on tape! After this flight I started to get better pretty fast. The batteries got damaged and I had to dispose of them which was a blow considering the cost of Li-Po’s. I searched around for alternatives to Li-Po’s and came up with A123 batteries. I bought a pack and tried them out. I was very pleased with the results! Flight times was about 5 minutes on the setup I was running which wasn’t grate as I like to have long flight times. But I rely like the A123 and will be using a lot more of them! As you all you heli pilots know, it’s not a cheep hobby! 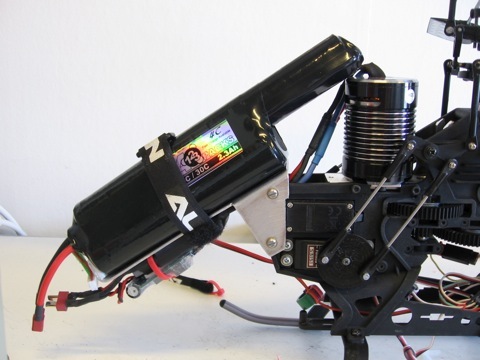 I was now running a Z20 Motor, 7sA123, 55A Jeti Spin ESC, KOK 505 carbon blades and a nearly complete metal head. But I finally realized that it was to much money in this hobby. Each crash was to costly and I had to wait a long time before I had the money to buy new parts. 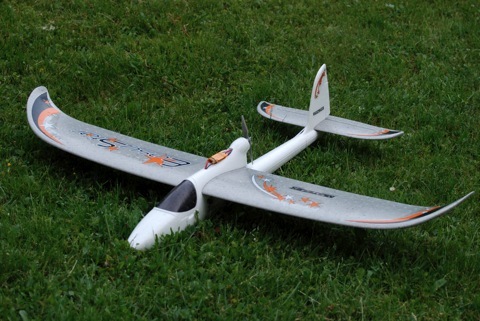 I had bought an Easystar that summer and realized that the fixed wing part of the hobby was they way to go. It was cheap and the flight time was long. Now I only fly my airplanes, which is kind of sad. I have a lot of fun with them, especially the FPV stuff. But it’s not the same as a heli. There will always be a hole in my heart where the discontinued Corona 120 used to fly, which was the best heli I ever owned. This is the end of the tale of the Helis.